We offer 3 fully-furnished lakefront homes on the same property on Saunders Lake with easy access to the sand dunes. This vacation retreat borders the Oregon Dunes National Recreation Area with direct access for hiking, horseback and off road vehicle riding, no trailering needed. Sand vehicles are available for rent near by. We are 1 mile from the Pacific Ocean which is a 5 minute drive or 30 minute walk through the dunes. 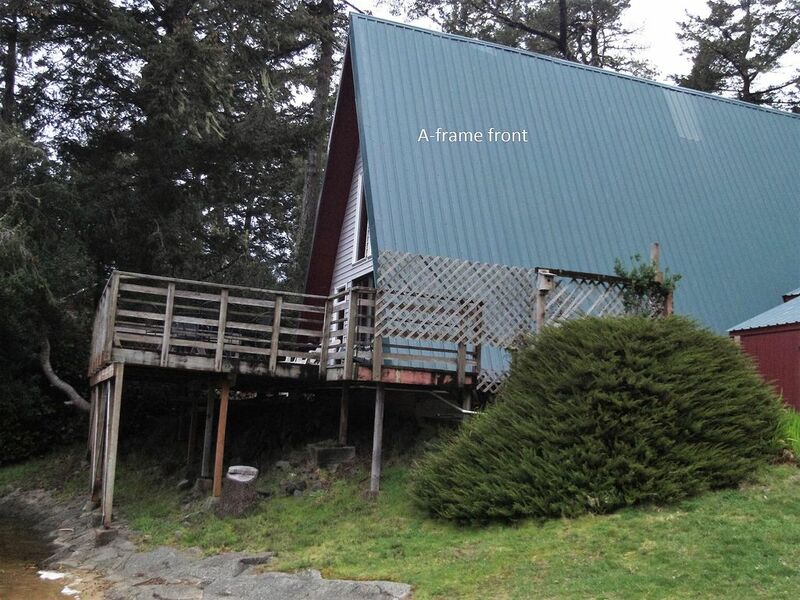 This house, the 3 bedroom (two queen beds, one twin bed ), one bath A-frame features a large deck right on the lake with a beautiful unobstructed view. the living area has a fireplace and and a second-floor master bedroom with balcony. There is also a "bike barn" to securely park your quads. Pedal and row boat. Bring your life jackets.